Ryerson University’s athletes may outdo themselves in the coming season thanks to a new fitness initiative that was launched this month. The Nutrition and Exercise Testing (NExT) Lab, a high-tech fitness testing lab, can accurately determine resting metabolic rate, body composition, and fitness levels. The services are free for Ryerson’s athletes. Other students and faculty get a 50 per cent discount to get tested in the lab, which usually costs a total of $300. The lab, run by Ryerson nutrition professor Nick Bellissimo, offers three fitness tests: The Bod Pod measures body fat percentage, the calorimeter calculates how many calories are burned daily while the body is at rest and a treadmill calculates the body’s maximum oxygen consumption, called VO2 max, to determine overall aerobic physical fitness. He added that Ryerson was one of the first universities that integrates this type of high-quality testing to support the athletes and help them track their progress and improve their performance. The men’s soccer and women’s basketball teams were a part of NExT lab’s pilot testing in 2014. After receiving their results, they were given advice on how to increase their VO2s. Lee also said that seeing his results and learning where he ranked in relation to other athletes was very motivating for him. “I’m very competitive, so when I see my results I always try to get better and improve those results,” Lee said. Testing athlete’s fitness levels is not the only service that the NExT lab hopes to offer. Bellissimo says that the goal is to incorporate the lab into all of Ryerson’s athlete’s training regimens in the 2015-2016 year. While the tests are free for the Rams, it is up to individual athletes to undergo testing. Bellissimo says this will be a comprehensive way to track athletes’ progress during the season. “The tests are highly accurate and therefore result in better progress for people who are trying to lose weight or change their exercise routine,” says Bellissimo. Lee says that he would like to do the test again and see how he has improved. “Testing after the season ends would be ideal for me, just to see if it actually paid off, if I actually did get better. It’s definitely very motivating,” Lee said, adding that he would recommend the test to anyone who is interested in improving their fitness performance and likes working out. The discount for Ryerson students and faculty offers a competitive price compared to other institutions in the Greater Toronto Area that offer similar services. Vincent Wong, NExT Lab’s senior technician, said the tests give users affirmation that their workouts are effective. 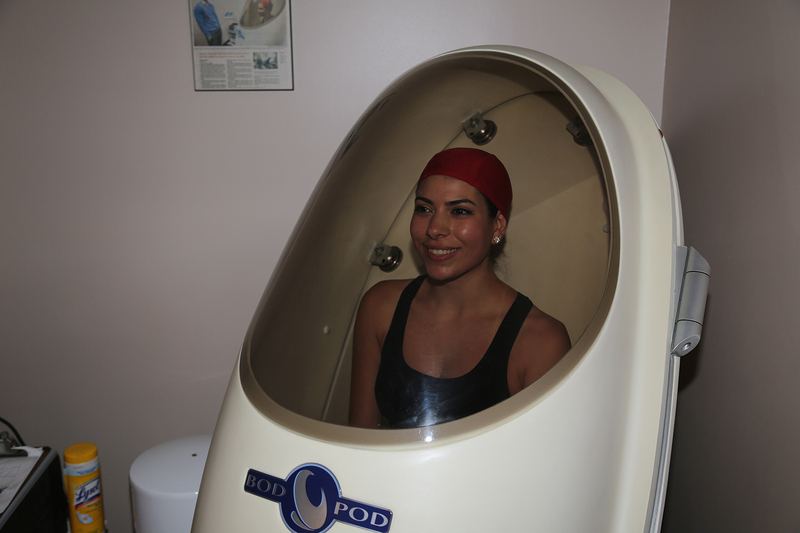 “Something like a Bod Pod is telling you – you are losing fat. Something like a resting metabolic test is telling you you are becoming more metabolic, that you are burning calories just at rest because you’ve gained muscle,” he said. “I am a believer that the number on the (weighing) scale means nothing,” says Wong.